I don’t expect to write directly very much about hardware and other nuts & bolts technology. After all, I did this for two decades while at millimeter mag and elsewhere as the analog production and post worlds waned and digital took hold. That’s about enough, and others cover it so well now that why should I bother? But I’ll still reserve space to take notice when significant changes are afoot. This is one of those times. The NQDVP (pardon the impromptu abbreviation) is a game changer for individuals and small production companies strapped for the cash to buy top graphics systems. It pushes the trend to harnessing GPUs for graphics, whether in production (virtual studios) or heavy-duty compositing and graphics. 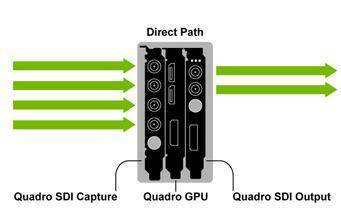 The three cards price together around $5000 to $8000; this depends upon your choice of the Quadro FX 3800, Quadro FX 4800, or the recent Quadro FX 5800, with its league-leading 4GB RAM, to go along with the Quadro SDI Capture card (enables uncompressed video to be streamed directly to Quadro SDI-enabled GPU memory) and Quadro SDI Output card (provides the integrated graphics-to-video output, enabling 2D and 3D effects to be composited in real-time with 2K, HD, and SD video). At the IBC, Nvidia and Adobe held a joint demo of a system fitted with the FX 5800 card along with Elemental Accelerator, a video processing plug-in for Adobe Premiere Pro CS4 that leverages the card’s GPU to speed up video decoding, processing, and encoding. Attendees reported near real-time results for most Premiere timeline effects, including heavy duty Gaussian blur operations, as well as very speedy MPEG-2 encoding for DVD output. In the PNY booth, Brainstorm Multimedia demo’d its virtual studio and 3D broadcast graphics software running on the setup. Brainstorm, which has sold virtual studio systems to NBC and the BBC among others, said they could now capture four 1080 HD inputs, composite and output high-quality graphics, all in real-time. Assimilate has already announced Rocket Fuel, an $11K bundle that includes the Nvidia Quadro FX3800 SDI board, RED’s RED Rocket accelerator card, and Assimilates’s Scratch Cine 4K post workflow for real-time ingest, conform, delivery, and output of RED One 4K digital camera material. Supposedly Assimilate is also close to releasing a real-time color corrector for RED footage based around the cards. With a rumored price around $15,000 for the workstation, you can see what graphics card improvements can deliver for the whole RED ecosystem, as well as other post.